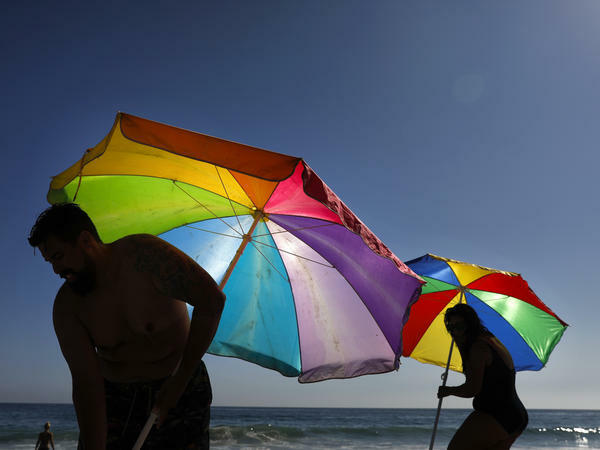 Mario Ramos (left) and wife Tally adjust their umbrellas in Laguna Beach, Calif. The state was among a number of places this summer that experienced their highest temperatures on record. All of this would suggest that more people must be experiencing heat-related illness or death. But it's more complicated than that. In the U.S., in fact, heat-related illness appears to be declining. A team of researchers led by Francesca Dominici, a professor of biostatistics at Harvard University, studied heat-related deaths in 105 U.S. cities from 1987 to 2005. They found that the risk of death from heat declined significantly even at very high temperatures. "The population has become more resilient to heat over time," the authors concluded. Heat exhaustion (or heat stress) is the body's reaction to loss of water and salt. Symptoms include dizziness, thirst, nausea, a rapid pulse, cramping or fainting. If heat exposure continues, you can get heatstroke. That's when the body loses the ability to control its temperature, which rises precipitously. Heatstroke can be fatal. All these things are preventable if you escape to an air-conditioned room or take proper precautions like staying hydrated. And it seems people may be getting that message in the U.S. The Harvard researchers' findings could be related to the fact that more people have air conditioning in their homes. It could be that public health safety messages are more common or are more effective in getting people out of hot places. Whatever is driving it, Jeremy Hess, a medical doctor and heat-illness researcher at the University of Washington, says it's encouraging. Increased exposure and increased protection "kind of compete with one another," he says. "And, for now, it appears that the increased protection is winning out — which is good news." But Hess' own research suggests that it's not winning out uniformly in the population. He found that emergency room visits for heat-related illness were relatively high in rural areas, perhaps because of more exposure to heat and/or less availability of air conditioning. Some research also shows that agricultural workers are exposed to heat more often. Hess found that men and boys are more likely to suffer from heat illness than women or girls, as are low-income populations and those with certain pre-existing medical conditions, such as kidney disease. One thing that concerns scientists about heat stress relates to a peculiarity of global warming: Temperatures are not dropping as much at night as they used to. "If you are highly exposed [to heat] at night," says Hess, "when normally your body would be able to recover somewhat, then it just speeds up that process" of heat stress. Dr. Samantha Ahdoot, a pediatrician and climate adviser to the American Academy of Pediatrics, says other groups are also especially vulnerable. "The elderly, who are least able to compensate for high temperature, are at the greatest risk to extreme heat," she says. People who work outdoors and student-athletes should also be extra careful. "Of all emergency room visits for exertional heat injury, more than a third of them in the United States are in teenage male athletes," Ahdoot says. The rate for football players is 11 times higher than all other teen sports combined, she says. A particularly warm year doesn't always bring severe heat waves with it. But climate scientists say that over time, a higher average global temperature means that we'll see more — and more extreme — heat waves. In fact, climate scientists have now stated that at least some heat waves from the past several years were likely or very likely the result of climate change. As the climate continues to warm, scientists warn that the incidence of heat-related illness will rise. A new study projects a big increase in the number of emergency room visits for heat-related illness. Based on two scenarios (moderate warming vs. severe warming), there will be 21,000 to 28,000 more visits every summer by 2050. That increase is not related to a higher population; it's strictly the result of more intense heat waves. Insurance companies and the actuaries who advise them on risk are also anticipating more claims and higher health costs. According to researcher Jesse Bell with the North Carolina Institute for Climate Studies, actuaries and insurers are combing through hospital records to find out who has been coming to emergency rooms with heat stress and what distinguishes those who are most vulnerable. People with renal disease, for example, are particularly prone to having problems, as are people with cardiovascular disease. Sixteen states and two cities (San Francisco and New York) are now participating in a program led by the Centers for Disease Control and Prevention, called BRACE (Building Resilience Against Climate Effects). Preparations vary from state to state, but in general, officials anticipate a need for more public information and quicker, more widespread response to heat waves. Many local governments in New England, for example, don't send out heat warnings or advisories until the heat index reaches 100 degrees. But there is evidence that heat-related illness can occur well below that level and some scientists recommend lowering the threshold. Other cities are exploring things like heat monitors for the elderly, and taking other steps — like planting trees — to try to lower the local temperature. But heat isn't the only thing that is changing as the climate warms. Research quoted in the federal government's Global Change Research Program notes that there is already an increase in the number of heavy rainfall events. Intense wildfires and droughts are also occurring more often, partly because of overall warming. That is of concern, says heat illness specialist Jeremy Hess, because these events can exacerbate the effect of heat waves. "There's, like, a heat wave and then a wildfire," he says. "Or a heat wave and a power outage. Or a heat wave and a drought. And the risk of those things is also becoming more substantial."